Do you or your spouse have children from a previous marriage? Do you or your spouse have any children who have died leaving children? Does anyone to whom you may be leaving part of your estate require any help or protection in managing money or other property? Do you and your spouse have a pre-nuptial or post-nuptial agreement? If someone is disabled, please explain. Is anyone at risk for becoming seriously ill or disabled because of a medical condition or family history? Has anyone in your family recently entered a hospital or skilled nursing facility? 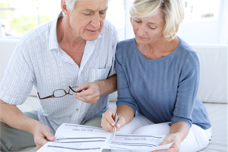 Have you or your spouse made any transfers or gifts during the past five years? Current statements or list of all brokerage accounts, bank accounts, certificates of deposits, life insurance, annuities, etc. Please indicate how assets are titled and who is the beneficiary.